Toy Story 3 contains one of the greatest third acts I've ever seen. As the third entry in the franchise, Toy Story 3 is also in and of itself one of the greatest third acts I've ever seen. It's yet another triumph from Pixar Animation, continuing their perfect streak. Bristling with inventiveness and visual delight, Woody, Buzz Lightyear, et al confront their greatest crisis with their owner Andy leaving home for college, relegating them all (except Woody) to the attic. Instead, they are accidentally donated to Sunnyside Day Care, which turns out to be a hard labor camp run by a disgruntled stuffed bear named Lotso. Toy Story 3 creates huge laughs from Buzz being reprogrammed to his caliente-dancing Spanish language default and even more laughs from Barbie meeting Ken, whose devotion to his vast wardrobe makes one wonder about his proclivities.The voice acting is phenomenal all around, lead once more by Tom Hanks and Tim Allen as Woody and Buzz, and joined by Ned Beatty as Lotso and Michael Keaton as Ken. All of this leads to the aforementioned gangbusters third act, in which Woody leads his friends on a prison break that puts them in a series of thrilling Indiana Jones-style cliffhangers. The truly transcendent moment comes when Andy decides to donate all of his toys to another child, carefully and affectionately explaining what each toy means to him, validating how much he loved his all-important childhood companions. One would have to be missing batteries or possess a molded-plastic heart to not have their eyes water when Andy (and we) said goodbye to his toys. 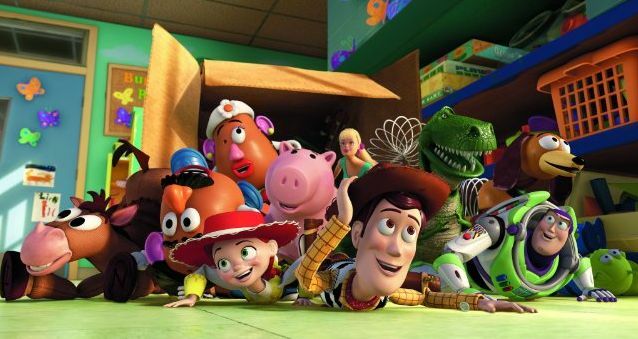 Thus far, Toy Story 3 is the best film of the summer and of 2010 as a whole.